Scrap Metal Recycling in the UK is a £5.6 billion industry and employs over 8000 people. The pure size of the industry makes a net contribution to the UK balance of trade. It is a hugely important cog in the UK’s economic machine and we are proud to be at the forefront of the industry. Becoming Greater Manchester’s largest and most respected Scrap Metal Processors was no walk in the park. It has taken over 40 years of hard work, sweat and tears but we the North Wests largest and longest established scrap metal dealer, servicing industrial, commercial and domestic customers. We were established in the 1970’s in Broadheath by the late Jack Davidson. Over the years the company has grown but still remained a family run business. We now operate out of a state-of-the-art purpose built 2 acre site in Altrincham, Cheshire. The site is run by Jacks son Jamie and his two sons Luke and Lee. Since our establishment over 40 years ago the industry has become far more competitive. However due to our experience, knowledge, staff, equipment, policies and levels of service we have set ourselves apart from the competition. A strong focus means we never rest on our laurels and we endeavor to continually challenge our own methods with the intention to always improve. As a result we were one of the first companies in the North West to be credited as an Authorised Treatment Facility for the safe disposal of end of life vehicles. Although we often find ourselves involved in much more our core business is, and has always been, scrap metal recycling. 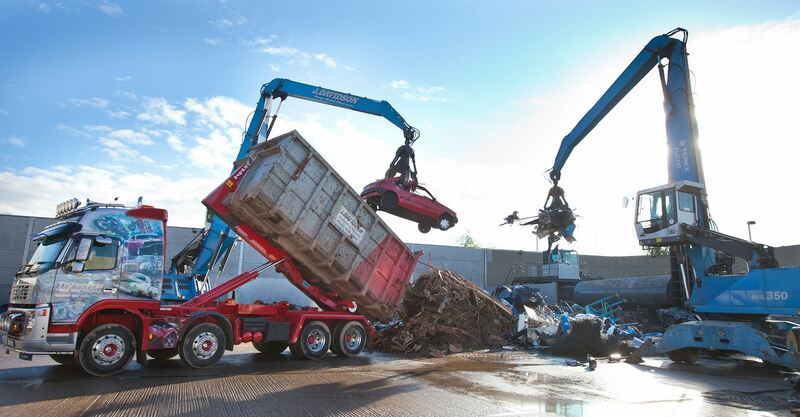 Annually we recycle approximately 40,000 tonnes of scrap metal using only the most up-to-date equipment available to the scrap metal industry. So if you’re looking to scrap your old and unwanted car or sell any scrap metal in Manchester then contact the experts at J Davidson Scrap Metal – Manchester. Call us on 0161 928 9981 or visit our scrap metal – Manchester website for more information. Have a look at our timeline for a more detailed view of J Davidson’s glorious past. Like us on Facebook and follow us on Twitter for all the latest news, offers, events and competitions. This article was posted in Scrap Metal, Scrap Metal in Manchester, Scrap Metal Processing, Scrap Metal Processors, Uncategorized. Bookmark the permalink. Follow comments with the RSS feed for this post.Both comments and trackbacks are closed.